Written by Mark Forrester on October 20, 2010 Blog. You gotta try this out! Look at that icon! This has been months in development working with the talented iPhone app developer Oli Kenobi. Together with Kenobi Studios we’ve been working tirelessly on conceptualising and developing a WordPress iPhone app like no other, specifically for those wanting Tumblr like functionality on a WordPress powered site that they own the content for, and can manipulate however they wish. 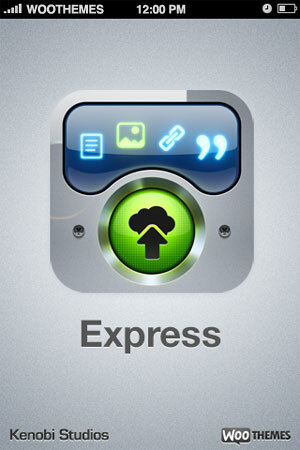 The beautiful Express App icon was designed by Anton Zykin a few months ago and proved an instant hit on Dribbbble. It works seamlessly with our WordPress Tumblog themes, and of course the new WooTumblog plugin. Find out more on it’s dedicated site – www.express-app.com. The Express app site is built on the Apz WooTheme for iPhone applications. Naturally. Get excited about the possibilities because we certainly are. Express is available on the app store for the very affordable price of $4.99. $4.99 to transform your website into a mobile publishing machine. This is awesome work I have seen in the recent time. Congratulation to Woo Team. I have been eagerly awaiting this release for a while! With that said, the missing element for me is video. My iPhone allows me to upload video on the go and post to YouTube. While grabbing the embed code isn’t super easy from the phone, it’s still feasible. Any chance we may see video added to a future release? Thanks for the continued innovation! Definitely hope to add video on a future release. A not too distant future release! We’ve actually planned originally to implement video and audio posting, but had so many problems with it, especially uploading them, that we had to remove these features. The experience was just too bad. I noticed the official WordPress iPhone app now supports video upload, but when I tried it, I encountered the exact same issues that we had. Like you, and probably many others, I would really like to have video support, and I will work on that. However there are other improvements that have a higher priority on my list. I recommend you follow @expressapp on Twitter for any update about the app. Nice job but … Where is Android version please :\ ? that is unfortunate… I bet if you took a poll here asking who has an Android powered device you would be surprised. We’ll see how popular Express proves and make a decision on Android based on that. Yep, put the poll up and see how many Android users would love to use it. I would definitely use the Android app. I would use it too! Wow, looks great! I’ve been wanting something like this … will be very useful. Now you just need to add a Tumblr import option in the plugin to pull over our existing Tumblr sites into a Woo-tumblog theme, and we’ll be all set! HELL YES. When I tweeted t’other day about the iPhone App, I was told “soon.” Who knew it would be this week?! Great work, guys. Buying the App now! Neat. I can’t wait to play with this. I do mean it. Great attention to detail and observation of what is needed. Love it. I noticed one small thing for a future update of the app – the ability to add tags to the various pieces of content. Other than that, man – this is a killer mobile blogging app. I recommend you follow @expressapp on Twitter to get any news about the app. Tags and categories are not the priority unfortunately, but we’ll definitely implement them in the future. Nice job, we are expecting plugin for other mobile platforms. The plugin looks awesome and is just right for a fan club type site I am working on. But I seriously wish if the plugin was based on Custom Post types rather than on custom taxonomy. Would have been real flexible to work on it then. Will still give it a try and check if it suits my needs. Great work. WooThemes, you Rock! I’m buying this for sure. Good work! Installed the plugin on Canvas and bought the iPhone app for my iPad. It’s very slick! Not a big deal viewing a tiny app on the iPad because you’re not dealing with too much content anyway. The first thing that occurred to me is that I can’t have multiple accounts (you know, like all of the twitter apps). So if I could have a bunch of accounts that I can easily switch between, that would make this very useful for me. Also, for the Tumblog admin (awesome btw), I would LOVE to be able to sync with a Facebook page and Twitter account and then simply check a box for which service I’d like to syndicate my update to. An example would be like updating status on a Ning network or something. I’m sooooo close to having this working completely… I was able to add the content tag above the_content and the_excerpt, but my current theme is Amazing Grace (a customized child theme). It handles entry titles differently… so links posted with no other content don’t show up as links in the title. How would I use the woo_tumblog_link_content tag? Do I have to add ALL the individual types of content calls and remove the woo_tumblog_content tag? Sorry, my knowlege of PHP is pretty minimal. All of my ‘problems’ started in about 7th grade (currently in 11th). Basically, I get headaches everyday that start from minutes after I wake up until when I go to sleep. Which leads me to my next big issue: sleep. I cannot remember the last time I slept all the way through the night without waking. I wake up at least 2-3 times around midnight till 6 am usually. I get back to sleep relatively soon, but it’s frustrating. Are there any plans on adding the tumbler navigation to the tumble plugin? There are a few woo themes that have this navigation built in, where I can click the ‘video’ icon and it will traverse the page to show me the next video tumble, etc…. I added this to canvas, but did not see this option anywhere, nor could I find any documentation on adding this functionality. I’m also curious as to the reasoning behind using taxonomies vs. custom post-types for tumbling. To date, I have not seen a really detailed explanation of the ‘concept’ behind tumbling, other than quick posting, and why the taxonomy system is used. I suppose the entire tumble concept just doesn’t make sense to me. Hi there. Any chance of a bookmarklet like tumblr employs? This would make it a perfect 10. I actually purchased a theme that works exclusively on this app and come to find out its only for the iphone? Have you guys done your homework on the amount of people that have the android OS on their phones? Android has far surpassed the amount of people that are using the iphone. If you are not working on this at all which I see you mentioned above it would be fair to make it a little more obvious on the website. Is there anyone that knows of any active development for an android alternative to this? If so, can you share the details?